This December I had the privilege of reading Educated by Tara Westover. I’ll be honest, I didn’t quite know what I was getting myself into. Thinking it would be more about the education aspect of Tara’s life than her life growing up without it, I was shocked and in awe of her courage as the story unfolds. Her memoir tells of her life growing up without education and how she breaks away from her eccentric family, going to college and eventually getting a PhD. When we read books we often picture ourselves in the shoes of the main character. I found myself identifying with her desire to believe everything her family said growing up and struggling to realize their beliefs didn’t have to define her. Education, and I would throw in travel as well, opens your eyes from what your small world is to what it could be. Wrestling with changing your beliefs as an adult is an internal struggle that is almost impossible to verbalize. The people you love, the people you spend your time with, shape who you are. What do you do when you find yourself in an unexpected disagreement with a friend? How is it possible this family member can think so differently than me? Perhaps the hardest part of growing up is realizing that all the people you hold dear won’t always agree with you. People that you work with with and meet might not even LIKE you. This can either be your greatest defeat, or greatest asset. The ability to love someone despite your differences is powerful. The same goes for yourself. You must still love and believe in yourself; you must be ok knowing that you might be different than the people you hold love. Tara found that in her book. She found a way to respect her family without condoning their behavior. She has not cheated what she believes to be right, even though it meant losing people she thought would be there for her forever. The truth is, no one in this world can know you like you do. Family, friends, colleagues know us for different reasons. So what happens when you start to grow or change? I like this quote because Tara describes something many of us have felt. Growing up, learning, and molding into the humans we want to be might mean changing what you previously agreed on with friends. Just because someone has assigned you as a specific role in their head does not mean you are obligated to fulfill that role for them. Ultimately you must be confident in what you know, strong in how you do it, and have faith that you are on the right path. For me, that’s learning to listen and wait for God’s direction. For you, that might mean simply believing in yourself and not what others tell you is true. As we move into 2019 I’m encouraging myself and others to be the best authentic version of themselves. What’s the point of people pleasing if it means losing yourself in the process? You can do this! P.S. Read Educated. Grab a glass of wine. Enjoy! 1 & 2 Corinthians Summer Study Begins! I am getting really excited as I start learning the history of Paul and the Corinthians in preparation for the new She Reads Truth study. In this study about 1 & 2 Corinthians I’m curious to hear Paul talk about topics such as love, spiritual gifts, repentance and resurrection. It’s really interesting to me, as I read about common problems for the church of Corinth, how relevant they still are today. (I’m sure I’ll see even greater connections after the study). Arrogance and the desire to gain social notability is just as relevant now as it was then, even if the context has changed a little. We are surrounded by people that live to please themselves, that search to gain better jobs or more recognition, to get more money or more followers on social media. Can some of these things be great? Absolutely. But how easy it is to fall into that trap of desiring it for your own benefits and not for the advancement of the Word. I’m so guilty of this. As my Wine Women & the Word bible study starts for the summer I am excited for us rockstar women to have some real talk about love, redemption and our roles. We will strive to connect these principles to our every day lives. These aren’t just stories to read, they are guidelines on living. Are we going to read the letters and ignore the teachings? Or are we going to choose to really understand and apply what we know? I’ve thought about what it would be like to totally disconnect from social media for a day, for a week, or a month. I like to understand and know what is going on, so for me social media would be the hardest thing to completely give up. I think a clean break from scrolling through feeds on Instagram, CNN or Pinterest would be so much more challenging than I like to admit. But I’m feeling tired. I’m feeling brought down by the world and the worldly expectations of others. We are here to build each other up, so why do so many of us feel weighed down? As we start week 1 and 2 we will begin to learn what it means to boast in the Lord and to find our roles in the body of Christ. I may not be a member of Corinth’s church, but for any of us that believe and know about Jesus we are members of his church and are given a specific way to live wisely and lovingly. I’m excited to see what we learn and to share our journey along the way. Read below for a history and background of 1 & 2 Corinthians. Having this base knowledge will create even more depth for the study. Allow yourself to read, connect and learn. Out of the 27 New Testament books, Paul is attributed to 13. Paul was originally born as Saul. His early life was not one of a Christian. It involved hatred towards the Christians, arrogance and persecution. He was a an educated Jewish scholar that originally thought Jesus to be a false Messiah. He even took part in the stoning of a Christian man named Stephen. Paul had a life altering encounter (some say supernatural) with Jesus that caused him to see and repent. This just shows that no one is too far gone to turn their lives around. Acrocorinth is a small, but step mountain high on the Peloponnesian peninsula in southern Greece. 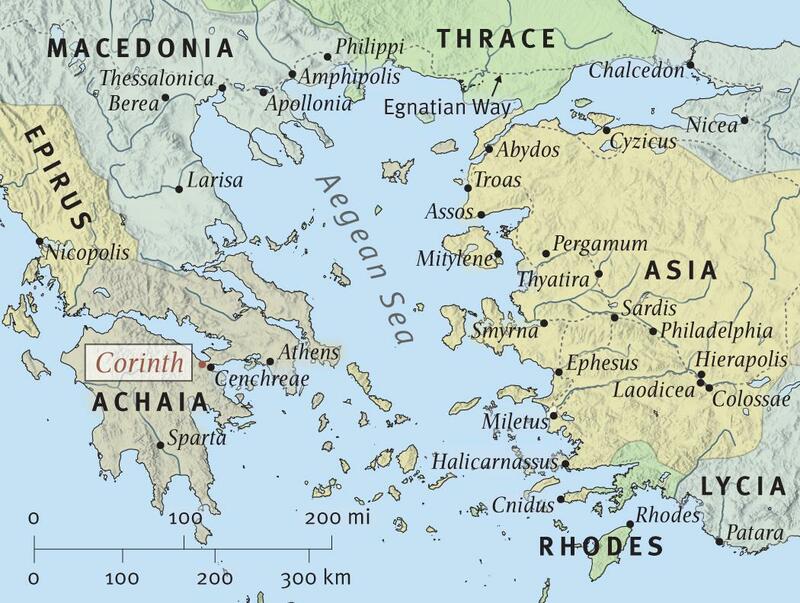 Corinth was built at the mountain’s foot. This city was destroyed in 146 BC due to a war with Rome. In 44 BC Julius Ceasar rebuilds Corinth as a colony of Rome. The author Pausanias wrote about Corinth in the mid-second century and described the city like a tour guide of pagan monuments and sacred sites. Corinth was littered with many temples. The letters 1 & 2 Corinthians were written by Paul from the city of Ephesus in the Roman province of Asia. Paul wants the church in Corinth to work together to advance the gospel. He is writing to them because they have become divided by arrogance and pride, especially among those of the more powerful members. Paul brought the gospel to Corinth and a church was established. After settling in Ephesus for 3 years, he heard word of the church’s problems and he sent a letter to the church addressing problems such as sexual immorality, division in the church and social snobbery. This extended letter (also known as 1 corinthians) addresses the root of the problem: arrogance. He says that living in this way was incompatible with God’s free gifts to them in Christ. The gifts including: wisdom, righteousness, sanctification, and redemption. A self centered lifestyle as the expense of the under privileged was simply not going to cut it. It was clear that their personal social advancement was more important than the gospel’s advancement. The second letter to the Corinthians (the book of 2 Corinthians in the bible) focused on the relationship between the suffering and the power of the spirit in Paul’s life/ministry/message. This letter is a response to a complicated history between Paul and the Corinithian church. Paul sent Timothy to Corinth and found the church, again, in turmoil. Paul then went to Corinth himself to resolve some issues, but found a small minority of the church to be very rebellious towards him. He left and extended mercy to them. He writes to strengthen the majority of the church that are faithful and to offer the small percentage of rebels a chance to repent. He covers topics about encouragement, discipline and joy over the repentance of the Corinthians. Paul has a crazy cool story about accepting Christ and changing his lifestyle. What have you seen in your life, or someone else’s, that has changed dramatically since learning and following Christ? The Key Verse for the She Reads Truth introduction of our 1 & 2 Corinthian study is: 1 Corinthians 1:9 God is faithful; you were called by him into fellowship with his son. Jesus Christ is our Lord. What do you think this verse means? What do you hope to know more about this verse and this study? As I sip I read my combined Women & Word section posted below. This poem is so simple and yet impactful. 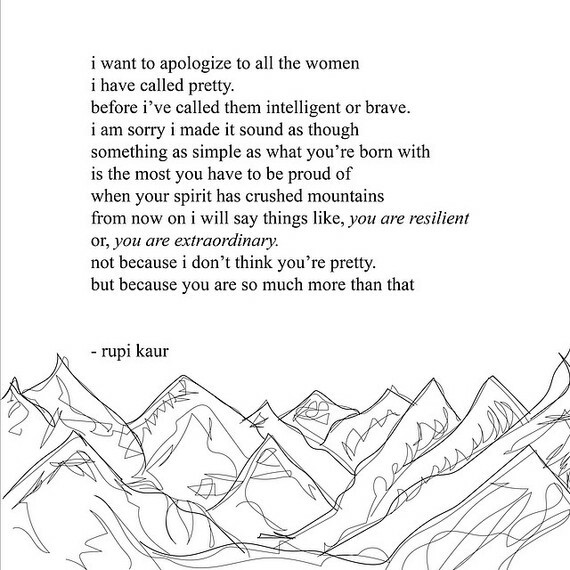 Each of you, though pretty, are born with so much to be proud of. You were born on this earth for a specific purpose only YOU can fulfill. Don’t forget that and don’t forget to keep striving for your greatness. Remind a friend today of all they are worth and that they are important.